The question of how many candles are on a menorah has a couple of different answers, depending on what the menorah is being used for. Most people tend to know of the menorah as a symbol of the Jewish holiday Hanukkah, but there are other meanings and uses for these simple yet lovely candle holders. The menorah is a symbol of the Jewish faith, and is recorded in the Bible as first appearing in the days of Moses. According to the Bible, the first menorah was made from a single piece of gold, and presented for use in the first Temple of Jerusalem. Throughout history, the menorah has been used as a symbol of worship, and has been adapted along the way to include the Hanukkah menorah. How Many Candles Are on a Menorah? While there are other variations, the most common types of menorahs have seven or nine candles, depending on what they're being used for. The image of a menorah appears on many artifacts, including ancient coins and gravestones. When asking how many candles are on a menorah, the most common answer is nine. This is because today, the menorah is most often associated with Hanukkah, the Jewish celebration of the seven-day battle against the Greek-Syrians in which the Jews reclaimed their Second Temple. At that point, only a single days' worth of oil was found inside the temple to keep the menorah lit. However, during the reclaiming ceremonies, the oil lasted for eight days, at which time new oil could be purchased. This is seen as a miracle, and the reason for the number of candles on the Hanukkah menorah. Eight of the Hanukkah menorah's candles are level with each other, to symbolize the eight days that the oil lasted. The ninth candle, which is either elevated or shorter than the others, is used to light the other eight candles, and referred to as the Shamash. The lighting of the menorah is the most important part of the Jewish Hanukkah celebration. The menorah should be placed in an uncovered window, as part of the purpose for the candles is to spread the word of the miracles the menorah symbolizes. Many families choose to light their menorahs outdoors, just to the left of the entrance of the home. Candles in a menorah are most commonly white, but any color can be used. Hanukkah lasts for eight days, and each night one lit candle is added to the menorah. So, on the first night, the first candle is lit using the ninth candle. The next night, two candles are lit. This continues until the eighth night, when all of the candles are burning bright. Facing the menorah, place one candle on the far right side of the menorah. Using the Shamash, light this first candle, then replace the Shamash in it's holder. 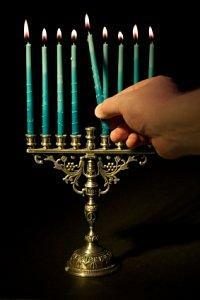 Each successive night, add another candle, going from right to left, until all of the menorah branches are full. Prayers and blessings are recited both before and after the lighting of the candles. Hanukkah games, songs, and other activities can be shared with family and friends after lighting the menorah. The menorah should be lit just after sundown, and left burning for at least 30 minutes. Handmade candles can add a special and thoughtful touch to this celebration. No matter if a menorah has seven or nine candles, it is a lovely symbol of religious freedom, associated with deep meaning and tradition. Menorahs can be lit by every member of a household, with several of them burning at the same time.